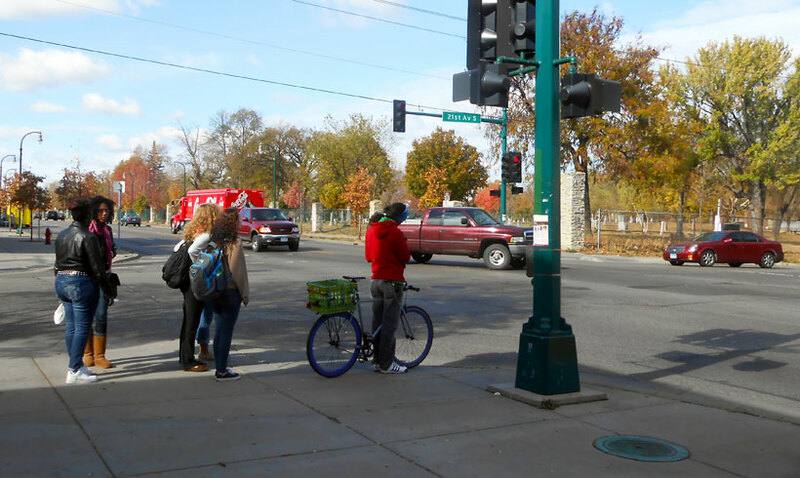 Editor’s Note: The following excerpt from America’s Walking Renaissance by Minneapolis-based writer Jay Walljasper is a strong reminder that pervasive racial and socio-economic inequity impacts even the most universal way of getting around. Clearly there’s work to do–here in the Twin Cities and across the country–to ensure access to a walkable community is not limited by race, income, age, or ability. We expect this to be a key topic at the 2017 National Walking Summit coming to Saint Paul next fall. TLC’s Executive Director Jessica Treat serves on the local host committee. “The health benefits of walking are so overwhelming that to deny access to that is a violation of fundamental human rights,” declared Robert D. Bullard, credited as father of the environmental justice movement. Jaw-dropping silence seized the room as Bullard showed a succession of maps illustrating how patterns of historic racial segregation and current poverty strongly correlate with low levels of walking and high levels of obesity, diabetes, hypertension and heart disease. “Health disparities don’t just happen by accident,” he explained. They are the tragic legacy of racism and unequal economic opportunity. Being able to walk safely, Bullard pointed out, is literally a matter of life and death. “Research shows that walking can give you seven more years of life,” he said. It is a stark fact that children, older Americans, the poor, people of color and people with disabilities are injured or killed more often while walking (or rolling, in the case of people using wheelchairs and motorized carts). Many disadvantaged people now think twice before traveling on foot due to dangerous traffic, crumbling sidewalks, street crime, or a lack of stores and public places within walking distance. Poor conditions for walking among low-income households, people of color and some immigrant communities limit their access to jobs and education. One-third of all African Americans and one-quarter of all Latinos live without access to a car, according to a report by the Leadership Conference Education Fund which means walking and public transit (which involves a walk) represent important pathways to opportunity. “A big thing we could do to help low-income families is to make it easier to live without a car. And it would help middle-class families to switch from two cars to one,” says Gil Penalosa, founder of 8 80 Cities and an immigrant from Colombia. He notes that the average cost of owning and operating one car is about $8,500 a year. Despite all these roadblocks, people in disadvantaged communities still walk more than other Americans. “The fact is that we have twice as many low-income children who are walking or biking to school than those in affluent neighborhoods, even lacking the infrastructure to protect the children who walk and bicycle,” reports Keith Benjamin, Community Partnerships Manager for the Safe Routes to School National Partnership. Jay Walljasper—a Minneapolis-based consultant, writer and speaker on creating healthier, stronger communities—is author of America’s Walking Renaissance, from which this story is excerpted. You can download it on a free PDF here.